"When we saw a river, we had to stop so they could stand by it and think about it for a while. They had never seen water in that long and narrow, unsalted form before. The river was the Hudson. There were carp in there and we saw them. They were as big as atomic submarines." Kurt Vonnegut was a genius. If you were a publisher reading the synopsis (if he ever did such a thing!) on Slaughterhouse 5 you would probably need to have a lie down for a while, whilst you wondered if you ever dared print such a thing. But back in 1969 it was, and drew interest at a time of ant-war protests in the US. Vonnegut follows Billy Pilgrim as he stumbles towards the curtain of the Allied bombing of Dresden at the end of World War 2. "When a Tralfamodorian sees a corpse, all he thinks is that dead person is in a bad condition in that particular moment, but that person is just fine in plenty of other moments." Billy also meets his favourite author Kilgore Trout. "Are - you Kilgore Trout?" "Yes." Trout supposed that Billy had some complaint about the way his newspapers were being delivered. He did not think of himself as a writer for the simple reason that the world had never allowed him to think of himself in this way. "The - the writer?" said Billy. Slaughterhouse works on a number of levels. (Let me be clear, the book should not work, the fact that it does is a testament to Vonnegut.) It is funny, moving and informative. It brings into perspective the level of suffering in a city which Vonnegut describes as having no military significance (it was untouched until the bombing at the end of the war). Vonnegut himself survived the bombing as a prisoner of war in Dresden. Air attack on Tokyo by American bombers kills 83,793 people. Atom bomb dropped on Hiroshima kills 71,370 people. Conventional bombs dropped by the Royal Air Force and the United States Army Air Force on Dresden, kills 135,000 people. What I like about the book is the way you are drawn into the thought gymnastics that go on in Vonnegut's mind. He is clever, witty and provides a view on life that is refreshing and allows you to look at the human condition from a perspective outside the normal polite form of thought demonstrated by the mass of media that surrounds us. It's like discovering a donut sprinkled in brightly covered hundreds and thousands in a packet of cornflakes. Totally unexpected and a real treat at the wrong time of day. Disjointed from the normal patterns. Vonnegut was born in Indianapolis in 1922 and studied biochemistry at Cornell University. Visit vonnegut.com for more on Vonnegut and his work. Visit Amazon to buy the book. In the book The Tralfamadorians teach Billy that a person only appears to die. He is still very much alive in the past. Tralfamadorians say about dead people, "So it goes." Vonnegut died this April aged 84. Next Month: A Spot of Bother by Mark Haddon. 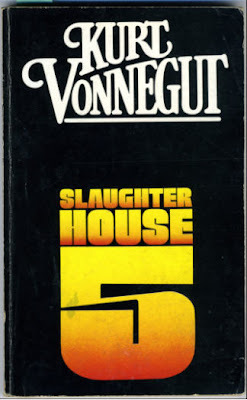 You're right, Mike: the structure of this book is so convoluted and the liberties Kurt Vonnegut takes with the positioning of the narrator are such that it seems unlikely that the book could work ... and yet it works beautifully. And it fits together like the best of jig-saws. Almost 40 years on, this novel feels fresh and daring. I must have read it three or four times in 30 years and still admire it, enjoy it and find something new in it every time. Paul: I have to admit I've only read it once whilst on holiday in France this year. Been meaning to read it for ages but it was never in the library, until I had a last look just before I left. I was only 2 years-old when it was published! This was the first Vonnegut book I read and I have gone on to read many more since. All his books shouldn't really work, they should, at the very least, leave you confused about where you actually are at any given time in the story. That they don't is testament to his great descriptive and observational skills. I have never felt confused when reading his books but I have wondered why I don't. Mother Night is another book where he confuses you and plays with your feelings. An underestimated genius, I wish I'd discovered him earlier. Tracy: Thanks for dropping by, you are right of course Kurt is a genius. Haven't read, Mother Night, will have to get it now you've mentioned it! Listen: we're throwing an event in his honor Saturday, November 10th in Dumbo, Brooklyn. PLEASE COME and share the love. gabe: Hiya sounds brilliant, thanks for telling us about it. Shame I'm in the UK, but any Brooklyn readers out there ? - it sounds a great event if you love Kurt's stuff.